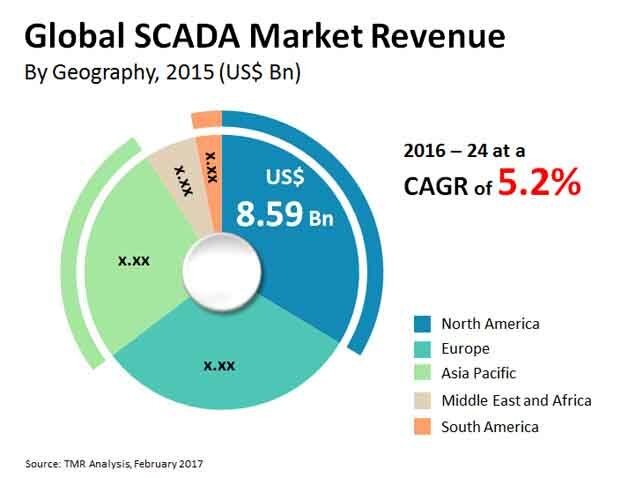 The top six players in the global supervisory control and data acquisition (SCADA) market accounted for about 60% share in the market in 2015. They are Honeywell International Inc., ABB Ltd., Schneider Electric SE, Rockwell Automation Inc., Siemens AG, and Emerson Electric Co. This makes the market consolidated in nature. Competition in the market is stiff with the prominent players increasingly looking to leverage mergers and acquisitions and strategic partnerships to improve their positions. A report by Transparency Market Research predicts the global market for supervisory control and data acquisition (SCADA) to attain a value of US$40.18 bn by the end of 2024 from US$25.56 bn in 2015. It is expected to expand at 5.20% CAGR from 2016 to 2024. Among the various end users in the global market for supervisory control and data acquisition (SCADA), the electrical power industry is the leading end use segment on account of the growing deployment of SCADA in total grid automation projects across developing countries of India and China, that are putting a lot of thrust on bettering their infrastructure to curb losses in power while distribution and transmission. Geographically, the key segments in the global market for supervisory control and data acquisition (SCADA) are Asia Pacific, North America, Europe, the Middle East and Africa, and South America. North America, among them, holds a dominant position in the market and going forward too will likely hold on to its leading position. In 2015, for example, North America’s leading share in the global supervisory control and data acquisition (SCADA) market was of 33.6%. Soaring demand for process automation systems in various industries, namely electrical power, water and wastewater infrastructures, and the oil and gas sectors is predicted to underpin the regions position in the market. Europe, powered by Germany, lags North America. The growing demand for advanced power and oil and gas, and need for efficient power production is stoking the market in the region. The Asia Pacific market for supervisory control and data acquisition (SCADA) is forecasted to be driven by the soaring demand for process automation in the oil and gas industry, rapid development of industrial infrastructure, better wastewater management, and upwsing exploration activities in new renewable energy resources in the near future. One of the main factors stoking growth in the global market for supervisory control and data acquisition (SCADA) is the growing knowledge among people about the advantages of SCADA, such as the reduced defects in the output, lessened production cost, real time detection of faults in machineries, and several other advantages offered by these systems in the production process. “The increasing deployment of SCADA systems in the electrical power sector in emerging economies for smart grid techniques in order to reduce the loss suffered in power transmission and distribution is likely to have a great impact on this market over the forthcoming years,” explains the lead analyst of the report. Besides, the increasing use of these systems to enhance oil and gas extraction and the rising interest in shale gas will also catalyze the growth in the market substantially in the years to come. Factors posing headwinds to the market are the increasing risk of cyber threats and the issues related to data integration in the oil and gas industry.